Samento is the trade mark for a very special variety of the Peruvian herb Cat`s Claw (Uncaria tomentosa). Cat’s Claw is a climbing vine that is native to the Amazon rainforest and has been used for over two thousands years by rainforest tribes to contribute to the immune system. The Asháninka people, who have the longest recorded history of use of the herb, make a clear distinction between certain Uncaria tomentosa vines - and now it has been revealed that there are indeed differences. It has been shown that the action of one of the main group of actives in Cat`s Claw bark - the Pentacyclic Oxindole Alkaloids (POAs), can be adversely affected by the presence of a further group - the Tetracyclic Oxindole Alkaloids (TOAs). However, certain plants are naturally free from this second group of alkaloids and Samento is only made with TOA-Free plants. Samento bark extract (Uncaria tomentosa - pentacyclic chemotype - TOA Free), Mineral Water, Ethanol. 1 drop twice a day 30 minutes before meals, increasing slowly to 30 drops twice a day. Not to be used with immune-suppressant medication, or by those who have had transplant surgery such as bone marrow or skin grafts. Should be avoided by pregnant women or those trying to fall pregnant. May cause Herxheimers reaction particularly where Lyme disease is present. Advised to start with a low dose. Below are reviews of NutraMedix Samento Microbial Defense Cat`s Claw - 30ml by bodykind customers. If you have tried this product we'd love to hear what you think so please leave a review. 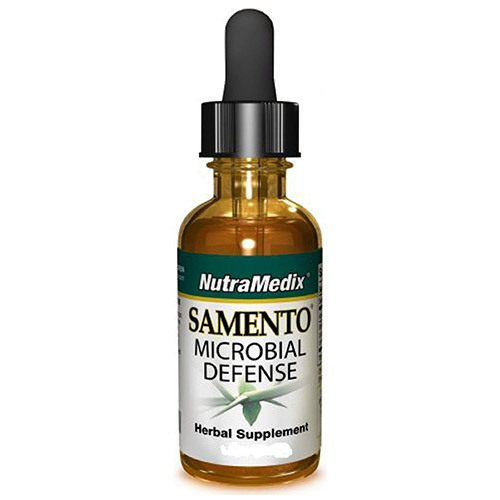 NutraMedix Samento Microbial Defense Cat`s Claw - 30ml - Samento may help support joint health and contribute to a healthy immune system.